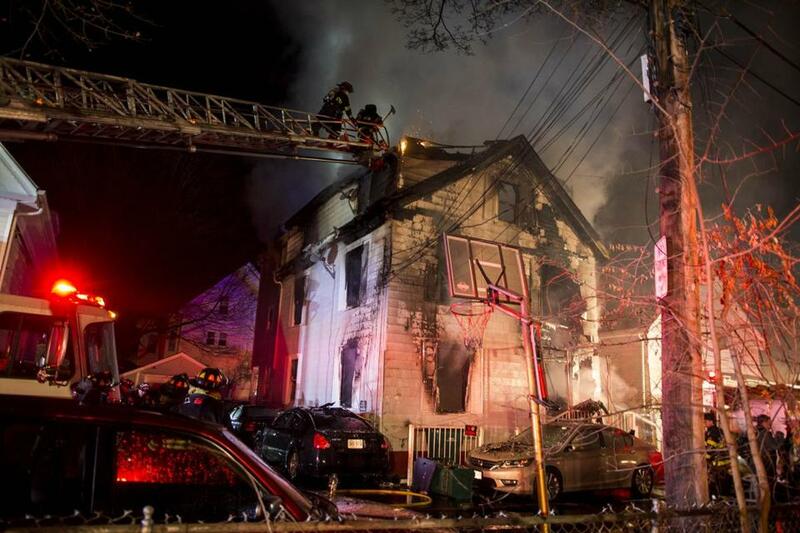 LYNN — Efrain Tavarez was in his backyard after midnight Friday when he heard the crackling of burning wood cutting through the cold air. He saw flames racing through the three-family home, where he and about 20 others lived. As the fire raged, screams rang out in the night. 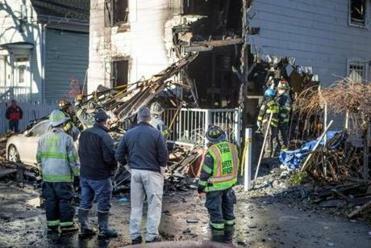 The fast-moving fire claimed the lives of four members of a family, including a pregnant woman. 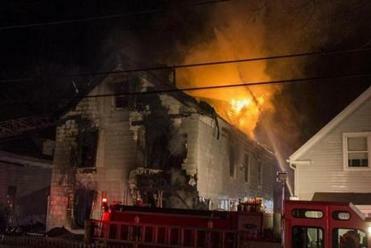 Authorities said they were still trying to determine the cause of the fatal blaze Friday night. In the minutes after arriving at the fire Friday morning, firefighters rescued two people before roaring flames forced them to retreat. Tavarez rushed into the burning building and rescued an elderly woman, who was calling for her family through the thickening smoke. Lynn Firefighters worked to extinguish a 3-alarm fire at 24 Bruce Pl. Simeon Cruz, who rushed to the apartment from his home in Haverhill, said two of his sisters, a nephew, and a niece lost their lives. Another sister, Marcia, escaped the building by jumping from a second-floor window, just after the floor collapsed under her son, who was in his 20s. 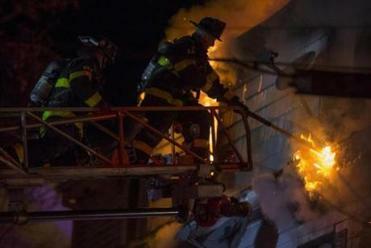 A powerful fire raced through an apartment building in Lynn early Friday. Nine relatives lived in the second-floor apartment on Bruce Place, a narrow dead-end street in a thickly settled neighborhood. Seven were home at the time of the fire. Cruz said one of his sisters, Sonia, was pregnant. His mother and a niece survived, along with his sister Marcia. Authorities did not identify the victims. They asked for anyone with information about the fire, or video footage, to contact authorities. The blaze broke out around 12:45 a.m. Friday. When firefighters arrived, flames were blowing out the windows. After learning that people were trapped, firefighters rushed into the wood-framed building without a hose, crawling across the second floor to rescue two women. “They had a choice to put water on the fire or get people out of the building,” said Jim McDonald, Lynn’s fire chief. He said one of the women was found in the dining room area and then firefighters heard a voice. “The firefighters climbed over a firefighter on the floor with the first victim and found the second victim,” said McDonald. After carrying the two women to safety, the firefighters tried to go back in for the others, but were forced to retreat, McDonald said. Once the blaze was controlled, firefighters went back inside and found the bodies of the four dead victims in the rubble. “The firefighters were in defense mode for 45 minutes before we got back close to the building,” McDonald said. The rescued women have serious injuries but are expected to survive, authorities said. Firefighters reported that smoke detectors were working in the building. City officials said the building had been cited periodically for sanitary code violations in recent years, but was in compliance with safety codes. Frank Obey, the city’s building inspector, said the building was a legal three-family home with 12 rooms, including six bedrooms. The city does not limit the number of family members who can live in a unit, he said. “We can’t separate families,’’ Obey said. Cruz said his family often complained about the smell of marijuana smoke, and wanted to move out of the apartment. Police also visited the residence, he and neighbors said. The property owner, Jane Jamgotchian of Nahant, could not be reached for comment. Two victims were transported from the house on arrival. Cruz described his relatives as hard workers and good Christians who went to church every weekend. He said his sister Marcia was trying to rescue their mother, who is in her 70s, when she was overcome by smoke. “She had to leave her and jump to the window,” he said. She tried to go back, but the flames were too strong. Firefighters were able to rescue her, and she is being treated at Massachusetts General Hospital for burns and smoke inhalation, Cruz said. His niece is also in the hospital, Cruz said. Leonor Rodriguez, 47, who lived on the first floor, said she first smelled smoke and then saw fire lapping at her back door. “I said, ‘Fire! Fire! Everybody out!’ ” Rodriguez said, wearing flip-flops and a light jacket in the chilly morning, her 7-year-old granddaughter, Leomarys, at her side. As she and her family tried to escape her apartment, the ceiling collapsed, she said. Her son, Wilmer Perez, 28, carried out Leomarys, his daughter. Marco Medina, 47, said the fire was so powerful that his wife burst into tears. Without the heroism of the firefighters, the toll would have been even worse, he said. Firefighters continued to work the scene of a fatal house fire. After he saw his family escape their first-floor apartment, Tavarez ran into the burning home, through the smoke and up the stairs to the apartment of his frail, elderly neighbor. He scooped her up and carried her to safety, then ran back to the house. But this time, the smoke and heat were too strong. Tavarez said his family remains in shock, and are worried about what happens next. “I don’t know where we’ll go,” he said. Paul Hoy, disaster action team captain for the Red Cross of Massachusetts, said volunteers were assisting 20 people from the three families. Mike Bello of the Globe staff contributed to this report. Peter Schworm can be reached at schworm@globe.com. Follow him on Twitter @globepete.